One of the most interesting fields in new technologies is without doubt Artificial intelligence (AI). To define the term of “artificial intelligence” it is a very hard process, which can be compared to the process of defining the term “robot” and “robotics”. The definition of Ultimate AI can refer to a machine made by human hands with the intellectual abilities and competences of humans, trying to recreate to the human thoughts as well as possible. Some of the human intellectual abilities are the abilities to learn, to use language, to reason and the most difficult of them to create new conceptions and ideas. Although the progress to the artificial intelligence is almost at the beginning some companies have made a lot of progress with into the field of limited artificial intelligence. The replication of specific elements of human thoughts is an achievement of the AI machines in our days. 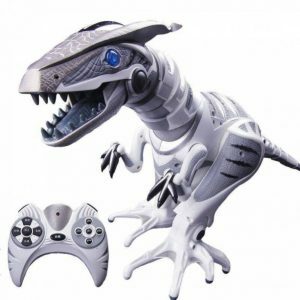 In our website you can find a lot of artificial intelligence robot for sale and learning ai toy robots for sale. If you want to buy ai robots of limited artificial intelligence do not hesitate to search our products so as to find the most suitable ai robots for sale. The robots with artificial intelligence is a real challenge to understand exactly how the work and interact in a specific environment. To develop an AI it is a difficult task due to the reason that it do not exist a concrete model of AI so as to work with it. Imagine that the human brain is functioning through billions of neurons that they are connected between them by electricity in various ways. This circuit of electrical neurons is almost impossible to understand it. We would like to mention though that the AI research is a natural evolution of the human and animal intelligence. The AI combined with the robotic design helps us understand better the anatomy of humans as well as animals. Imagine a future world where AI robots and humans will live together and help each other is a variety of tasks such as medicine, manual labor, health care and aviation. Following human evolution into Homo sapiens, it is predicted that man will evolve in the future into a hybrid, which will be the result of the union of humans with the robots (Homo Cyborg). In the future people could integrate their minds into robotic machines and manage in that way to prolong their lives for a lot more decades! Get here and welcome sophisticated artificial intelligence robots that are programmable through smart devices such as smartphones, tablets and computer. Meet systems that mimic elements of human behavior such as learning, adaptability and problem solving and put them in your everyday life. 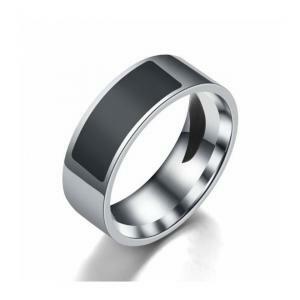 If sensors of gesture, movement, voice, temperature, infrared, etc. mean something for you, then you are in the right spot! Enter our website so as to acquire the best robots with ai for sale. The most affordable ai robots to buy is not a science fiction, but a reality which takes place on our website. 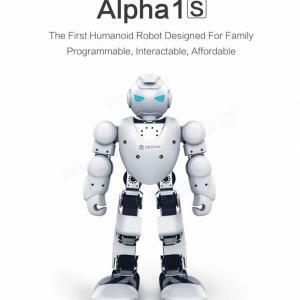 The Alpha 1S Humanoid Robot is a household humanoid robot with a potential for development and interactive entertainment. 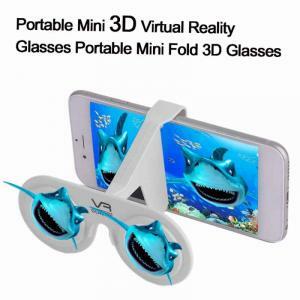 It’s perfectly designed with high-precision servo joints and editing software for 3D visual motions, which can be seamlessly controlled in one APP. Alpha 1S has a wide range of applications in different areas, such as entertainment, education, household, research and media. The Alpha 1S APP allows users to program the robot without PC software. Sequences of movements can be saved directly in the APP, making it much easier to program the robot. Bluetooth technology is onboard, meaning you can control the Alpha 1S from your compatible Windows, iOS, or Android mobile device without having to fuss with any wires. €610.00 Tax exc. €457.50 Tax exc. Roboraptor has fluid bi-pedal motion: walking, running and predatory gaits. His body movements are so realistic, from the turning of his head and neck to the whipping of his tail. He has three distinct moods: Hunter, cautious, and playful. He responds with mood-specific behaviors and sounds, as well as mood-dependent behavior. He is multi-sensory including touch sensors in his tail, chin, and mouth; sonic sensors with an infra-red vision system that detects objects in his path or approaching him. The small, intricately-constructd pieces of Roboraptor’s body make his body movements seem so realistic and dinosaur-like. Kids will love this real-dinosaur experience! €138.82 Tax exc. €104.12 Tax exc. Now anyone can own a tiny working version of the movie’s BB-8 droid that can roll and balance all by itself. 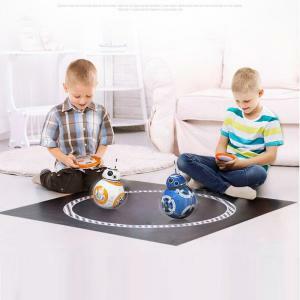 Once BB-8 is connected to your mobile device you have your choice of three different modes of play: Patrol, Drive, or Message. BB-8 doesn’t have any on-board sensors, so he’ll continuously crash into walls, feet, and furniture while he explores a space. But by keeping tabs on the toy’s speed and heading, the accompanying app allows BB-8 to learn the ins and outs of a space so he can eventually build a rudimentary map of a room allowing him to later avoid obstacles he’s already run into. 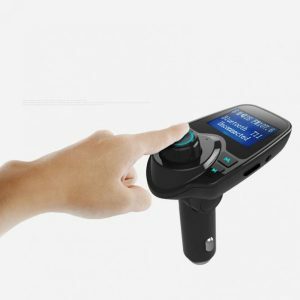 Remote control distance is 30 meters with 2.4G remote control system. Accompanied with magnetic suspension structure, autonomous patrol mode and one key dance mode. A great gift for everyone! €34.10 Tax exc. €25.58 Tax exc. 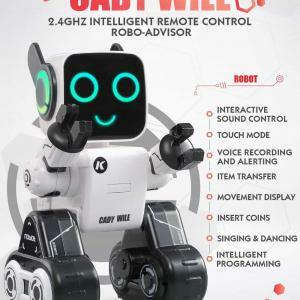 An intelligent RC robot which is capable of creating a lot of fun for your little kids. As your hand moves, the gesture sensor will detect such movement and make the robot advance, retreat, turn left / right. Interestingly, as it patrols forward and meets an obstacle in its way, it will move backward and then turn left / right. To create more fun, you can program a series of movements, and see the robot execute them rhythmically with dynamic music. €19.98 Tax exc. €14.99 Tax exc. 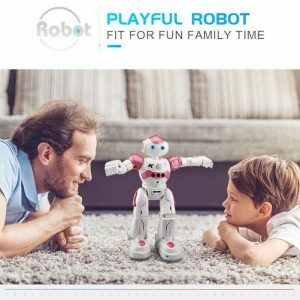 JJRC R4 is an intelligent RC robot which is capable of creating a lot of fun for your little kids. You can touch its head to make it speak. Press the “interactive sound mode” button clap once and the robot will play the recorded voice that has been alerted. The robot can help you carry and transfer small items and interact with each other. It helps kids to develop saving habits with the robot’s body designated into a coin bank. All the pocket money can be collected and stored here. The robot is programmable and able to display movements and move at its own. €40.30 Tax exc. €30.23 Tax exc. 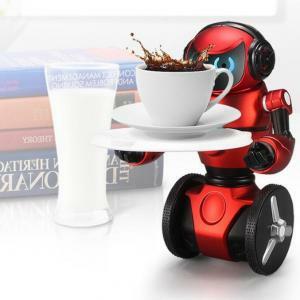 JXD KIB balance robot has cute design and intelligent functions. There are five core features: Drive : Go where you want it to. Dancing : Dance with Music. Boxing – Allow two robots PK game. 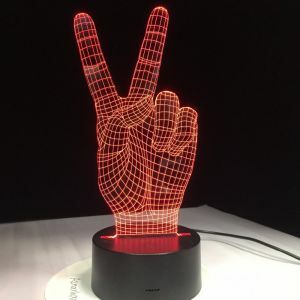 Gesture Control – KIB will detect hand gestures by its eyes’ IR transmitters, responds to Forward, Backward, Turn Left and Right. Balance – Stack object on top of the tray, keep it balance and let it move slowly. €37.25 Tax exc. €27.94 Tax exc. 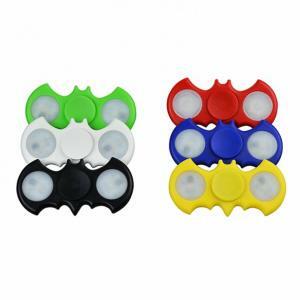 As a latest product of WLtoys, it has distinctive four operation modes. It can balance in two wheels, according to the gestures to complete various actions. And it can also controlled by G-sensor remote control to move forward, backward, left and right turn. 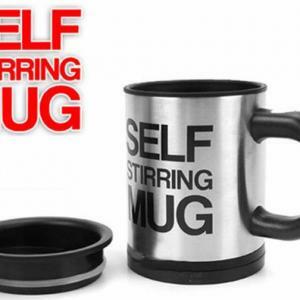 It is equipped with a removable tray that can hold about 500g weight! Robot head with infrared sensors can detect the presence or absence of obstacles ahead, make the appropriate action through internal calculations. With cute and lightweight design, it is good for all indoor occasions and you can take it to a lot of places. €35.82 Tax exc. €26.87 Tax exc.